I wish I was a winemaker, it seems such a wonderfully exciting, creative and honest thing to be. The skill and dedication required to make great wine beggars belief – the life consists of seriously hard work, but to the observer it seems attractive – idyllic even. Whenever I hear about mavericks who create little wine estates in particularly beautiful and romantic places, I am drawn into daydreaming about having my own vineyard – who knows, one day I just might, but I would need a good dollop of more technical knowledge first. Recently whole areas of Spain that I had previously written off as unlikely and unheard of wine regions have been opening up before me and they have really got me excited as to what is possible. Not that long ago Spanish wine was pretty simple – good stuff only came from the cooler north, except Sherry. Those certainties of the past are no more however, suddenly it seems that there is no area of Spain that cannot produce good – or even great wine. La Mancha, Jumilla, Yecla and Bullas all make good wines now, but most intriguing of all is Andalucia. Of course the province has long been world famous for wine, but really only one type – fortified. Andalucia’s most renowned product is Sherry, but Montilla-Moriles, Malaga and even Huelva all have a certain fame. Now, increasingly I am being made aware of the non-fortified wines from this most southerly part of Spain. My first experience of this was interesting, but hardly surprising; dry white wines made in the area of sherry production from the Palomino grape. Antonio Barbadillo’s Castillo de San Diego Palomino Fina Vino de la Tierra de Cadiz was the first such wine and is a great accompaniment to tapas – think very ripe Muscadet and you know what it is like. But there seems to be much more on offer in the region nowadays. Most noticeably since 2000 Huerta de Albala, near Arcos de la Frontera, have been producing fantastic quality estate wines from the Vino de la Tierra de Cadiz appellation. Their Taberner is a wonderfully luxurious pure Syrah, while the pinnacle of their range, the Taberner 1 blends in 20% Merlot and Cabernet Sauvignon for extra complexity. 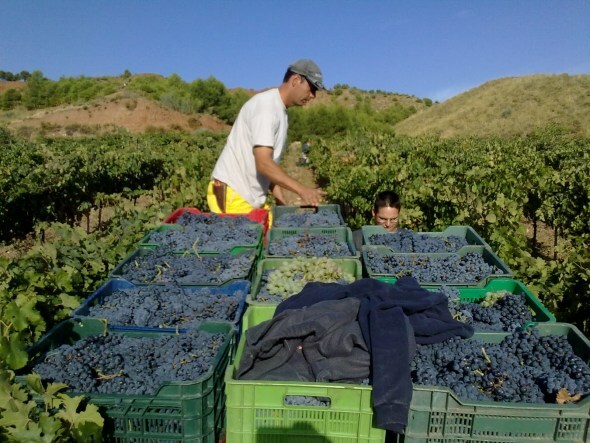 Even their entry level Barbazul which uses 50% of Tintilla de Rota – the local clone of Graciano – is a well made, enjoyable and interesting wine. 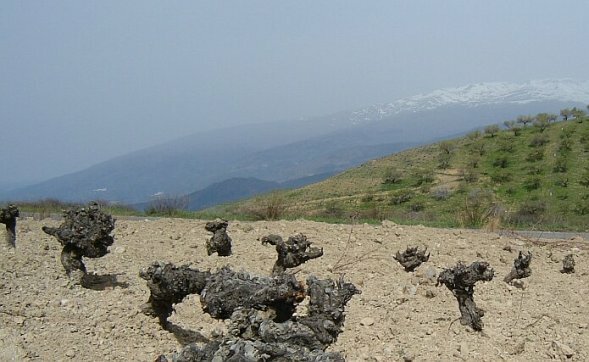 However the real reason for my current excitement about Andalucian wine is that there is some being made in the Alpujarra Mountains to the south of Granada. This is a stunningly beautiful region of Spain that although hot in the Summer has reliable and plentiful water flowing from the Sierra Nevada – the Alpujarras form the southern fringe of the Sierra Nevada. The area is very fertile and produces a lot of citrus – Chris Stewart’s Driving Over Lemons was written about the place. I would have supposed it to be too fertile for wine grapes, but the steeper slopes have thinner, less rich soils that seem to compensate perfectly. This amazing landscape is evocative of how many of us imagine Spain and the rugged terrain has become home to a surprising number of bodegas in recent years. They are all small and mainly one man band operations, building on the local traditions of making wine for personal production. What is different from the past is how ambitious many of them appear to be, not to create big brands or to sell millions of cases, but to craft high quality wine that are full of character and speak of their region. It is hard to generalise about a region that enjoys very little fame for wine so far, but the local grape would appear to be the Vigiriega, which only grows here with a little in the Canary islands – what is is with so many grapes beginning with a ‘V’? I had never experience it before, but the 2008 Brut Nature Sparkling Vigiriega from Bodegas Barranco Oscuro was a fascinating first taste of this grape. The acidity was high and apricoty, while the yeast autolysis from the traditional method gave satisfying levels of complexity and the balancing dosage of unfermented Vigiriega juice gave a cider-like, bruised apple fruit character. The whole thing is slightly obscured perhaps, because this bodega, like many others in this outer frontier of winemaking, embrace the ‘natural’ wine philosophy. The second white from this producer was also possibly my first Spanish pun! 2008 Tres Uves (uves is V’s, while uvas is grapes!) is made from Viognier, Vermentino and Vigiriega. It offered lovely orange scented aromatics while the oak was beautifully integrated on the palate. The vines here are grown at around 1400 metres above sea level where the cooler mountain air ensures the grapes do not cook, brings big temperature changes between night and day and are apparently the highest in Europe. In fact their top wine, a red, is even called Cerro Los Monjas 1364 after the height of the vineyard and the 2003 vintage is a smooth and supple – if bretty and funky – blend of Tempranillo, Pinot Noir, Garnacha, Cabernet Franc, Cabernet Sauvignon and Merlot. 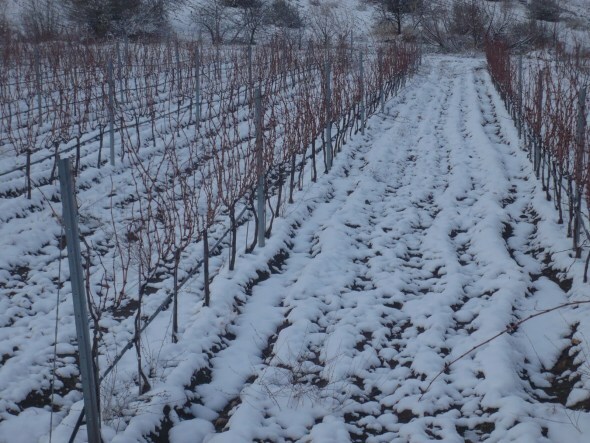 The height of course also ensures there is a proper winter to give the vines a real rest and snow is far from unusual in these parts. I was also intrigued to taste some wines from some 50 kilometres further north, in the Sierra Nevada proper near Gaudix. Bodega Cauzon is a labour of love by former restauranteur Ramón Saavedra, he does everything organically and counters the blistering summer heat of the region by favouring north facing vineyards, which he planted in 1999. His 2010 Cauzon Blanco was an unoaked, tangy and slightly salty blend of 30% Sauvignon Blanc, 30% Viognier, 30% Chardonnay and 10% Torrontés – which may or not be the same Torrontés as Ribeiro and Argentina! Ramón’s 2010 Mozuelo Tinto was a slightly confusingly (Mazuelo?) named blend of Cabernets Franc and Sauvignon, but was deliciously supple, richly fruity and hugely enjoyable – just the sort of wine to put this obscure, but promising place on the map. The next time you are in Granada and the waiter tries to sell you a Rioja with your meal you can tell him fro me that there are really interesting wines a lot closer to home. What with reports of sparkling wine in Huelva it seems that the wines of Andalucia are finally on the rise and worthy of far greater attention.